Environmental, Health and Safety News: FAIL - Subsidies make the least healthy foods the cheapest to buy. 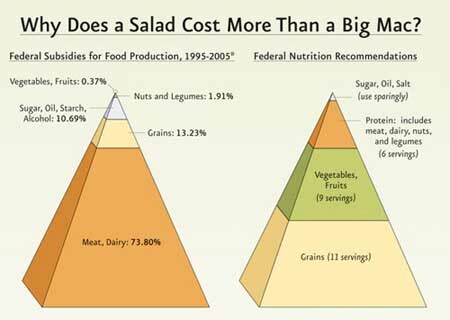 FAIL - Subsidies make the least healthy foods the cheapest to buy. ...Just mention subsidies and most people's eyes glaze over. But government subsidies transfer hundreds of billions of taxpayer dollars to large farmers who grow just a few types of crops, creating some of the country's least deserving welfare recipients. Subsidies set price minimums and ensure that corn, soy, wheat, and rice producers get paid regardless of how low prices for their crops are or whether they even need assistance in the first place. These subsidies support the cheap and unhealthy domestic food that shows up in the aisles of the supermarket. And they're the reason why a salad costs more than a Big Mac. Earlier this month, the Environmental Working Group, an environmental nonprofit, released its annual assessment of farm subsidies (which, because of changes in the law, is actually less transparent than in years past). The EWG's president Ken Cook says, "Even after the bitterly contested new health insurance reforms eventually take effect, most crops could fairly be said to have better coverage than many people in this country." If the Obama Administration is serious about Let's Move, its obesity-reduction initiative, then the country needs a better Farm Bill in 2012—one that places a priority on better health care and nutrition. Even the Wall Street Journal applauded Let's Move in its op-ed pages, saying, "The best outcome would be if ObamaCare dies and the first lady's anti-obesity campaign results in some modest success." The problem with the existing subsidies is that they don't to favor the majority of fruit and vegetable growers (nor the school kids that eat their produce). These farmers will need to at least double their acreage to reach Let's Move's proposed nutrition guidelines, writes The Washington Post's Jane Black. What if the money to pay for those new acres of fresh produce was taken from subsidies that make unhealthy foods artificially cheap? So far, the House Agriculture Committee appears to be making modest inroads towards this goal by replacing some conventional subsidy programs with crop insurance programs, so that farmers might grow more diversified crops and be encouraged to stop overproducing. As Paula Crossfield of the blog Civil Eats writes, "If the new Farm Bill includes this change, it could spur farmers to diversify their crops, spreading out their risk, thereby creating new opportunities for local food systems." Still, the next Farm Bill should aim for the heart of the problem, and lawmakers need to consider substantial reform. Spend a little time on EWG's database and then weigh in on the process before June 14. There's little doubt, judging by both the effects of subsidies and the looming federal budget deficit, that we need anything less than a complete overhaul.